With a serious passion for fast machines in any type of competition, Carl Spiering from Jordan Station, Ontario, and his Carl Spiering Motorsports Eaton 1967 Chevrolet Camaro Supercharged Pro Modified is quickly becoming one of the hottest Pro Modified racers on the drag race circuit. 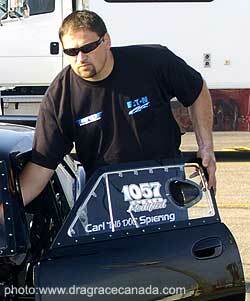 Although he did not win the championship, Carl Spiering believes his 2006 campaign in the competitive IHRA Torco’s CompetitionPlus.com Pro Modified division was successful. Consistency in qualifying, plus a stout and dependable engine program were key factors to his performance again this year. This highest average qualifier status gave Spiering and his team the best “batting average” for the season. While other teams may have qualified higher or lower at certain events, the Eaton Road Warrior always qualified well at each event with a steadiness and reliability that no other Pro Modified team matched. 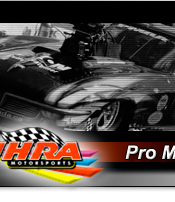 Most IHRA National events featured fields of over 30 Pro Modifieds, with a couple of events topping 40 cars and two boasting the quickest qualified fields in IHRA history, all vying for the top 16 spots for elimination rounds. Spiering, the 42-year old driver from Jordan Station, Ontario, finished the season in seventh position in the IHRA 2006 eMax Nitro Jam™ Drag Racing Series in his Eaton 1967 Camaro and continues to be a contender in the chase for the 2007 Torco Race Fuels Pro Modified Shootout. Spiering added he was particularly pleased with his engine program, which has remained rock-solid over the past several seasons. The Torco Race Fuels Pro Modified class features a special program based on each team’s final qualifying spot at each national event. The top eight in points will have the opportunity to participate in the 2007 Torco Race Fuels Pro Modified Shootout, which will be held at the IHRA Northern Nationals in Martin, Michigan. Spiering remains in the number one position in this category and has kept this since winning the 2005 Shootout again reinforcing his consistently strong performance throughout the 2006 season. 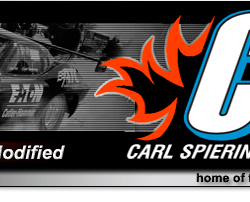 In 2005, Spiering had a strong season as he stepped up his race program, winning the IHRA Torco Race Fuels Pro Modified Shootout and the IHRA ACDelco Nationals and placed third in the IHRA World Championship National Event Tour. "That is a great accomplishment especially when you consider we only ran nine of the 12 national events during the 2005 season," explained Spiering. "Our new engine program with the Brad Anderson Hemi power and a great car from Tim McAmis helped us run our best time ever, 6.07-seconds at 235 miles per hour." Starting with a Pro Street 1980 Chevrolet Malibu that he street raced around the Niagara Falls on Sunday nights, Spiering found he was destined to compete at the drag strip. At the track, his Malibu was capable of 11.90-second elapsed times using a small-block Chevrolet engine. He dreamed of some day building a "9.90" car and running Pro ET, but as a young married man he simply did not have the resources to build one to the level he desired. Undaunted, he instead began racing snowmobiles on grass courses, where his professional racing career started. The success he enjoyed with his 650-cc Polaris did not go unnoticed and Bombardier, manufacturers of Ski-Doo snowmobiles, who offered him a factory-sponsored ride with full support. He operated his snowmobile racing team for four years, topping his sled racing with a class win at the New York State Grass Drags. On his way back to the quarter-mile, Carl purchased a 1964 Chevy II in Tennessee powered by a 468 cubic inch big block Chevy engine hooked to a two-speed Powerglide transmission. With recent changes to chassis regulations, Carl's Chevy II was not certifiable so he enlisted Eddie Bryck of the Chassis Shop in Toronto to build him a new chassis for the Deuce. At the same time, Carl decided the car needed some more go-power, as he wanted to run in the "fast" bracket. He began building an all-aluminum 588-cubic inch big block pure racing engine with alcohol injection. The new combination worked well and the car's performance level jumped into the 8.50-second range at speeds of 165 miles per hour. For the next two seasons, Carl campaigned the car in that trim and although he was usually in the hunt, he did not record any particularly notable wins. 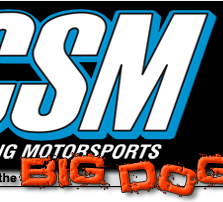 Noticing the growth and interest the Top Sportsman class was attracting at this time, Carl decided to advance his career and build a T/S car. Joe Van Overbeek of London, Ontario was selected as the chassis builder and a new Camaro was chosen as the body style. After taking all of 1994 and the first half of 1995 to complete the car, it debuted in mid-1995. A supercharged 540 cubic inch big block, Carl's first "blown" engine, and a Bruno/Lenco transmission made up the powertrain. Carl traveled to Bristol, TN for the IHRA Fall Nationals, and in his first national event, he qualified with an impressive 7.31-second elapsed time. Rain delayed the event until the next weekend, but Spiering chose to stay over and was rewarded with a third-round finish. The Camaro was campaigned throughout 1996 season before selling it to Hamilton-racer Bruce Boland. Spiering wanted to race Pro Modified, but he knew he would need the financial resources if he were to make this dream a reality. So to help get the money needed to race in this popular class, he started the business that he runs to this day, The Trailer Shop. He also accepted an offer from fellow Canadian racer Barry Paton to spend a year working on Barry's team to learn clutch maintenance. In 1998, Carl debuted a beautiful 1937 Chevrolet, which he had purchased at the end of the previous season. Powered by a 632 cubic inch Dart Big Chief engine on nitrous and backed by the Bruno transmission from his old Camaro he ran the full season at Grand Bend Motorplex where he won four events and was ultimately crowned the 1998 Grand Bend season Top Sportsman Champion. Carl joined forces with the Persico Bros. in 1999 and drove their nitrous-assisted 1967 Pro Modified powered by a 706 cubic inch Eagle. That year was a great learning curve for Spiering, and an ultimate team decision was made to switch the power plant from a nitrous-oxide injected engine to a supercharged mount. 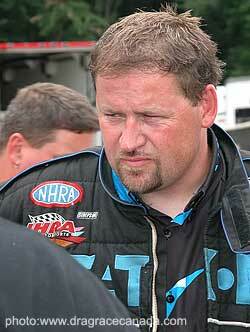 In 2000, the team changed to blown 526 cubic inch Chevrolet engine and was armed with new sponsors. Extreme Championship Wrestling and Pace American Trailer were the major contributors. Carl and the team had a great year, winning several rounds of eliminations, two-quarter final finishes, a number-two qualifying position at his home track in Grand Bend, best appearing professional team, and the third most published photos of any IHRA car that year. While assessing his future in 2000, Carl decided to order his own Pro Modified, a 1957 Chevrolet Bel Air. 2001 was a busy year for Carl as he secured primary sponsorship for the season with Eaton's electrical group in Canada and assistance from Pace American Trailers. Carl's Bel Air got off to a flying start, winning an IHRA National Event at Maryland International Raceway in Budds Creek, MD to give Carl his first national event win. After a strong season but no wins in 2003, Carl jumped at the chance to purchase Tim McAmis' personal 1963 Corvette Pro Modified at the end of that season. Carl struggled early in 2004 but after a successful session on the dyno, the second half of the year went much better with a much stronger engine. This past winter Carl put the last piece of the puzzle together when he purchased his own state-of-the-art Dynamic Test Systems (DTS) dynamometer system for his business Engine Research and Development, providing customers with the latest in power plant technology and created his own engine department. Carl appreciates the great relationship and strong support that he receives from his major sponsor, Eaton. He also has the strong support of his wife and daughters. In fact, both of his daughters race Junior Dragsters very successfully as another generation of racing Spiering is being developed.